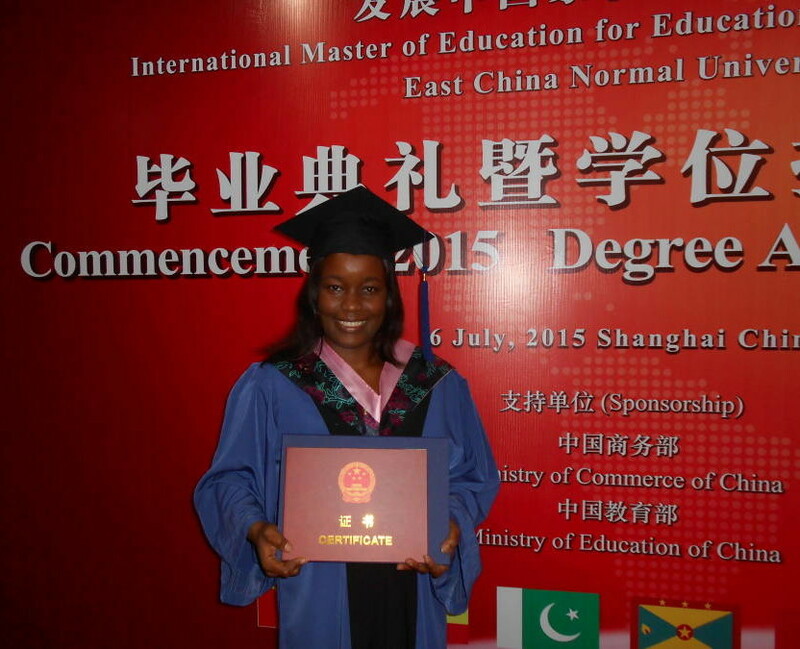 Vernesta Noel–Smart, a Graduate One (1) teacher of Hillsborough Secondary School, Carriacou who took up a scholarship at International Center for Teacher Education (ICTE) in East China Normal University (ECNU) in the academic year 2014–2015 was awarded for excellence. Vernesta is holder of Excellent Graduate of Shanghai City. She was awarded the title of Shanghai General Institutions of Higher Learning Outstanding Graduate 2015. This award takes into account diligence in study & research (GPA results considered); completion of the requirements of degree; engagement in extra-curricular activities; adherence of the laws of country & university and respect for different people and culture. Besides this award, Vernesta emerged top of her class, delivered the student representative speech at her graduation on 6 July 2015, and secured a Master of Education degree in Education Management (Leadership & Policy). She ascribed praise to God and credited her success to His blessings on her of a sound and focused mind through her educational pursuit. Also, to her own self-motivation, hard work & commitment to her study coupled with constant support and encouragement from her family, Seventh-Day Adventist church family and well-wishers. Vernesta expressed heartfelt thanks to the Government of the People’s Republic of China; Ministry of Commerce of China, Ministry of education of China, faculties of ICTE at ECNU, Ministry of Carriacou & Petite Martinique Affairs & Government of Grenada for the scholarship opportunity. She encourages Grenadians pursuing scholarship at home & abroad to put God first, stay focused, aim high, manage your study time and represent the tri-island state of Grenada, Carriacou & Petite Martinique well.